Horace David Sackett, whose family came to America from England in 1831, was born in Blandford, Massachusetts on December 29, 1843, the son of Leverett and Mary Culver Sackett. When he was eighteen years old, he went to Suffield, Connecticut and started a flourishing general merchandise and farming business that lasted for several years. On January 15, 1873, Sackett married Ellen Minerva Lyman (b. July 24, 1848) and became the parents of five children, Mary Mariah (b. July 8, 1875), William (b. June 22, 1876), Warren Lyman (b. August 30, 1882), Zella Myra (b. June 11, 1883), and Emily (b. March 1885). Sackett was a squat, spare, busy man with a short beard. He was cheerful and kindly but firm in his convictions. In 1887, with $10,000 in his pocket, he left Connecticut with his family and moved to Los Angeles. There he heard about land in the North Cahuenga Valley being subdivided for business and residential purposes. This new development called Hollywood was without lights, telephones, paved streets or other modern improvements. Each lot was going for a fixed price of $1,000 each. 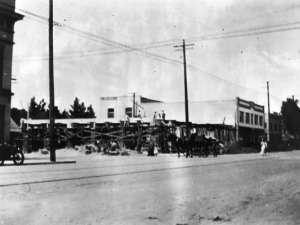 But Wilcox gave Sackett, free of charge, three, sixty-five foot lots facing the assigned business area at Cahuenga Avenue and the southwest corner of Prospect (now Hollywood Boulevard), if Sackett made certain improvements before the dummy line (the old steam engine with the open car) reached Wilcox Avenue. .
By 1888, the railroad was functioning, and Sackett built a three-story hotel building (above) of wood with a mansard roof, consisting of a corner store, and Prospect Avenue lobby and parlor. Behind that was the culinary department. The stairway in the lobby led to the upper two stories with eighteen rooms and a bathroom. Behind the hotel was a barn and corral; surrounding the store and lobby front was a cypress hedge and several two-year-old pepper trees planted by Wilcox, giving the place a very cozy appearance. 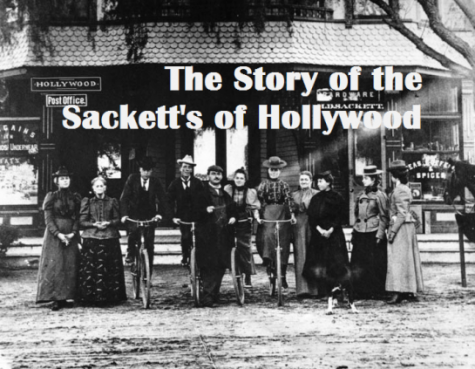 The Sacketts ran the first hotel in the Cahuenga Valley, and the second general merchandising establishment within the corporate limits of Hollywood. He also kept a few horses for his clientele and gardens to the blocks east and south of the store, to sell produce in his store. Sackett bought the lot south of the hotel, two lots facing west on Wilcox Avenue, and south of the two northern lots in the row. Here he ran an overnight and breakfast place for city visitors and a bachelors’ roost for the young single men of the village. At his store, Sackett sold butter and eggs, crackers and cheese, overalls, jumpers, boots and shoes, ribbons and yardage, and canned goods that were becoming popular. Another Hollywood pioneer associated with the hotel was Dr. Edwin O. Palmer, who later wrote a history of the area. Upon his arrival in California, he rented a room and an office there for his medical practice. Sackett’s daughter, Mary and her siblings, attended the old Temple Street School through grade school, but didn’t go to the downtown high school because they couldn’t get there on time. 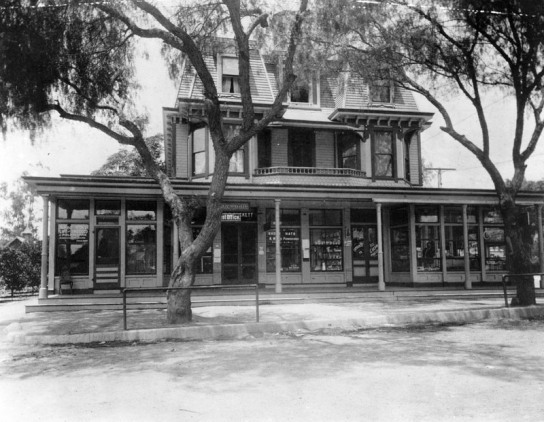 Later, Sackett added another store, where in a corner nook he opened Hollywood’s post office; Mary became Hollywood’s first postmistress, running her practiced eye over the little rack of boxes. For her duties, Mary was paid as high as $5 per month. 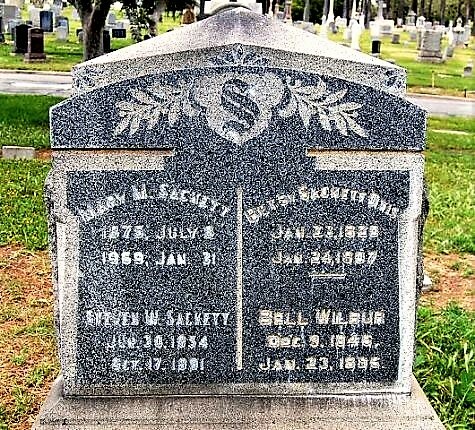 Tragedy hit the Sackett family in 1899 when his son, William died unexpectedly at 23 years of age and was buried at Rosedale, as there would not be a cemetery in Hollywood for another two years. Due to competition from the new Hollywood Hotel, built three years earlier at the northwest corner of Prospect and Highland, Sackett closed his hotel in 1905. He sold the property to Henry Gillig, but it remained unoccupied for the next five years except for one store room on the first floor. In 1907, Sackett built a six bedroom house on property he had bought at 1642 Wilcox Avenue. Later that same year, in the reception hall of their home, Sackett’s daughter Zella, married George Dunlap, the mayor of Hollywood at the time, and the city’s last since Los Angeles annexed Hollywood in 1910. In 1910, J.P. Creque, one of the wealthiest men in Hollywood, bought the former hotel property for $28,000 from the estate of Henry Gillig, who was now deceased. Creque razed the abandoned hotel and erected a fireproof two-story cream brick structure that cost approximately $30,000. The Hollywood National Bank leased a portion of the new building; there were three other stores facing on Prospect. The second floor had offices with wide hallways and tile flooring. . 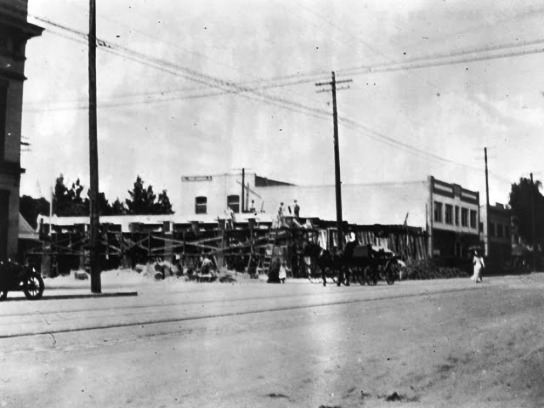 The J.P. Creque Building being built in 1911 on the site of the Sackett Hotel at the southwest corner of Hollywood and Cahuenga. In 1931, the Creque Building was enlarged by adding two stories; the Art Deco building at 6400-6408 Hollywood Boulevard, is still on the site. . The Creque Building as it appears today on the site of the Sackett Hotel. Now retired from the mercantile business, Sackett devoted himself to the management of his private interests and several properties that he owned. He took an active part in the public affairs of Hollywood and Los Angeles for many years and was a man of ability and worth. He was a staunch democrat and was interested in politics, especially in local matters. It was in their Wilcox Avenue home that Horace Sackett died in 1918, and was buried next to his son at Rosedale. In 1929, his wife Ellen followed him in death at the age of eighty from heart disease. 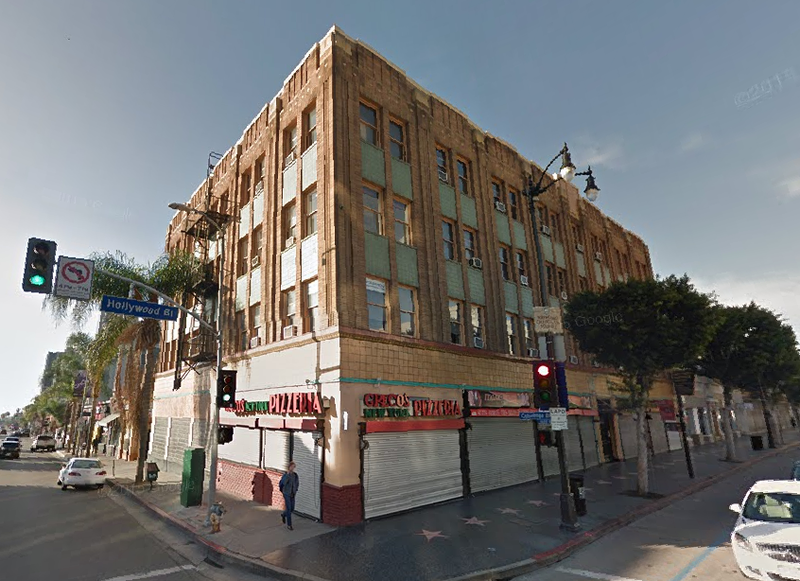 At the time of Ellen’s death, the area around Hollywood Boulevard and Wilcox had become mostly commercial, and land was being bought for business purposes. Mary Sackett was living in the family home, but instead of demolishing the house, she sold the property in 1929 and moved the house to the San Fernando Valley which was residential. 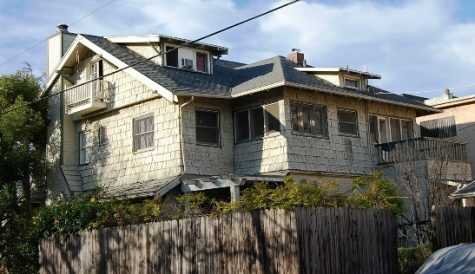 Remarkably, the old Sackett house is still standing at 10739 Kling Street in North Hollywood. The 1908 residence looks somewhat out of place next to the small bungalow homes built mostly in the 1930s. . 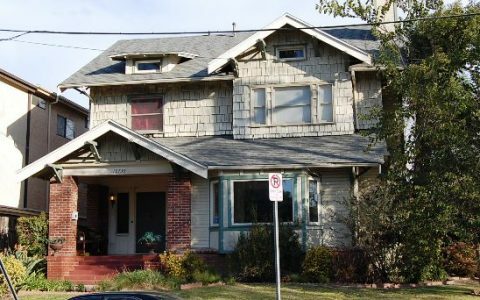 The altered, but original Horace Sackett home, once located at 1642 Wilcox Avenue in Hollywood, is now at 10739 Kling Street in North Hollywood. PLEASE NOTE: This is a private residence. DO NOT DISTURB the occupants. The rear of the former Sackett home. On Wilcox, a row of storefronts still stands in place of the old Sackett homestead. 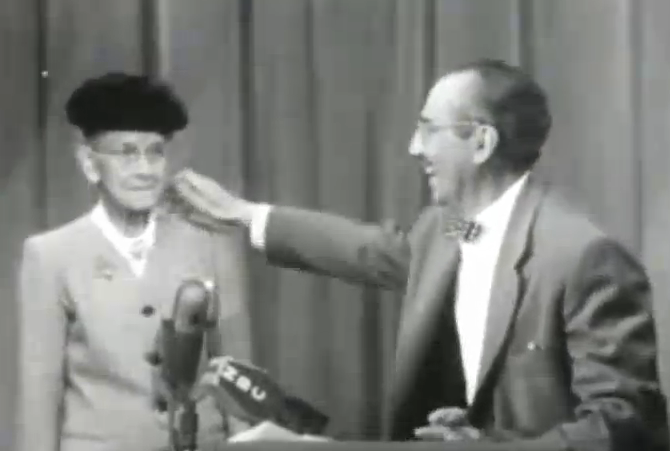 In 1954, at the age of 78, Mary appeared on an episode of the You Bet Your Life television show with host Groucho Marx and laughingly ruffled the comedians feathers. She asked Groucho to put away his trademark cigar, either lit or unlit, and he grudgingly complied. . When asked if a man might yet come along and sweep her off her feet, Mary replied, “Not a chance. I’m too set in my ways. I don’t want any man cluttering up my house.” When Mary died on January 31, 1969 at age 93 in Rosemead, California, she was the last remaining Sackett. She was buried in the family plot at Rosedale Cemetery. . 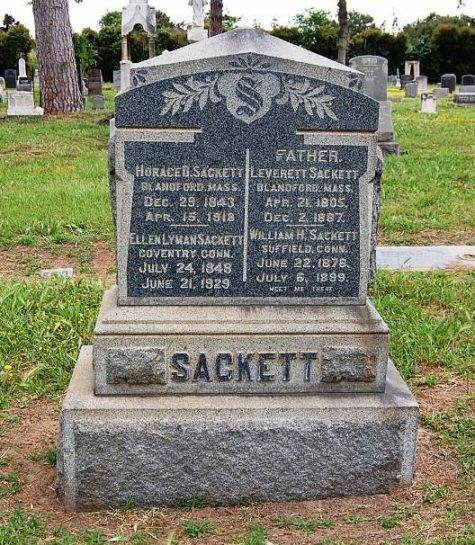 The Sackett family marker at Rosedale Cemetery. Mary Sackett’s marker at Rosedale Cemetery.